Celebrate! Celebrate! Writhe to the Music. 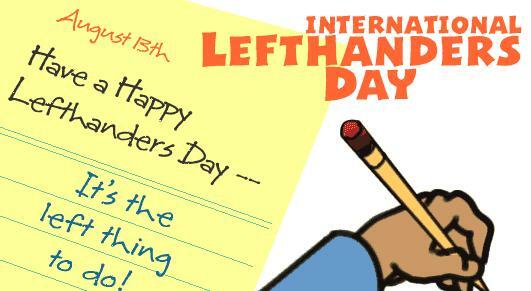 Just thought I would take a moment to wish everyone out there who’s a lefty (like me) a Happy Left-Hander’s Day. Pretty damn generous of everyone to give us outcasts our very own special one day out of the year. I’m figuring it’s because we Leftie’s are just so awesome any more than one day would be unfair to all those <yawn> normal people, but I could be wrong. It could be a remnant of the persecution left-handers have endured from the ignorant, superstitious people who seem to have dominated accepted thought for most of history. Nah! It’s probably the awesomeness. Don’t you think? Seriously, though. To this day I don’t think most righties realize just how many ways we southpaws make adjustments to what is predominantly a right-handed world. Even our language exalts being right-handed (Ambidextrous, as an example. Sinister [or sinistral] as another*). When sitting down to eat, I always gravitate to one of two corners where my elbow won’t bump into the person to my left and I can judge the quality of service at a restaurant by whether or not my server sets my second cocktail down on the proper (left) side of my place. I’ve been using right-handed scissors for so long, I find the ones made specifically for us lefties cumbersome. I could go on and on, but that’s not really my purpose. I just want to send a shout out to my fellow lefties; my southpaw homies (hefties?). Here’s to much ado about nothing. One day really doesn’t change much now, does it? This entry was posted on Monday, August 13th, 2012 at 5:44 pm	and tagged with ambidextrous, deftness, dexterity, handedness, Lefty, sinister, sinistral, Southpaw and posted in Personal, Random Thoughts. You can follow any responses to this entry through the RSS 2.0 feed.